Do you like to think of yourself as a goddess, but one with a dark side? Well, with Halloween coming up, we say it’s time to unleash your true self into the world. Look through our ancient greek and roman apparel to start your goddess costume. 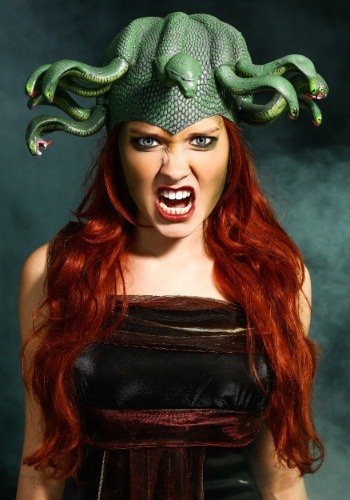 Then, in order to unleash the darkness, top off your ancient look with this terrifying Medusa Headpiece! The snakes, with that devilish look in their eyes, may not actually turn anyone into stone but it will be more than enough to make a few people stop dead in their tracks. Transform into one of the most feared names in ancient mythology with the help of this one accessory. Add it atop any Greek or Roman inspired outfits and you’ll go from a mere beauty to a powerful goddess! Show everyone exactly what kind of goddess you are this Halloween with this Medusa Headpiece.